Taunton Deane kale (Brassica oleracea var Acephala) a very old variety of perennial kale that keeps growing for years giving a tasty supply of greens all year round. It is also known as cottager’s kale and would have been common in vegetable gardens up until Victorian times. Plants can grow more than two metres tall and wide and are very hardy. Being perennials they withstand pests very well, survive all kinds of weather and have a flourish of new growth each spring and summer. They are extremely nutritious as they have many years to accumulate minerals and have a great flavour and are tender enough to eat raw. Taunton Deane plants do slow down after about 5 years, so it is worth making cuttings every now and again to produce new stock. CUTTINGS available see our shop page for details. Perennial Kales make great companions…We have also discovered that since we have populated our vegetable area with perennial kales, we have been able to grow our ‘regular’ kales without nets. Naked Cavolo Nero! who would have thought it! 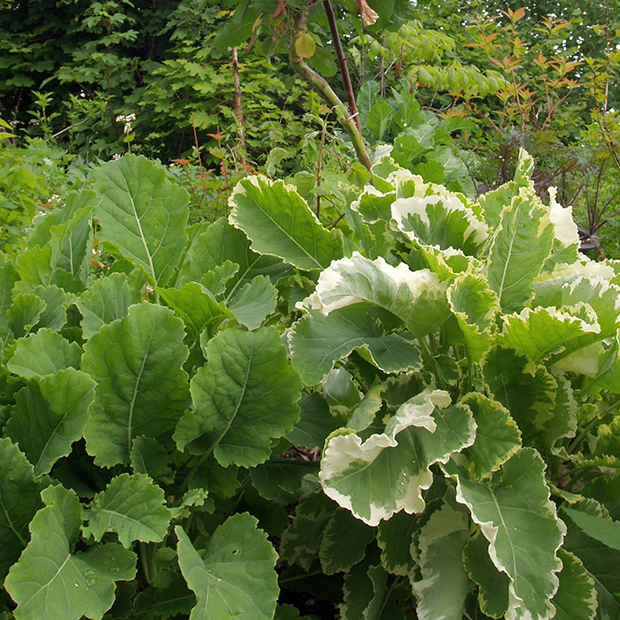 The perennial kales act as wonderful companions to the others as they take all the heat, leaving the others relatively undamaged by caterpillars. The perennial kales do get nibbled but shrug it off and have such resilience that they bounce back like nothing has happened. We also grow another perennial kale called Daubenton’s (Brassica oleracea var Ramosa) which has much more of a horizontal habit and doesn’t grow as large as the Taunton Deane. It does however grow for years and years, even decades in some cases. Both varieties do on rare occasions set seed, but propagating vegetatively from cuttings ensures that you keep the true characteristics of the varieties. This lovely photo of Daubenton’s and a variegated variety of Daubenton’s was sent to me by the wonderful Stephen Barstow ( you must check out his blog edimentals.com and also his fantastic Around the world in 80 plants book which was published earlier this year). We have both varieties of the Daubenton’s kale growing in our vegetable garden. Daubenton’s makes fantastic crispy kale ( shred, toss in toasted sesame oil and sea salt, hot oven 5-10 mins) divine! It is one of our winter staples. We also have been given three other types of perennial kales, as yet unidentified. One we have named ‘Egloskerry’ kale which given to us by a lovely gentleman at one of our talks. He rushed off to grab a great clump from his garden and we now have it growing. 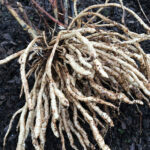 There is talk of an old Launceston perennial kale, maybe this is it, as Egloskerry is a short distance from Launceston. We were also given a perennial cabbage from Carol Wellwood who wrote a report for ‘Plants for a Future’ on Ken and Addie Fern’s 20-year experiment at Penpol. She tells us the plants originally came from there. We also have a thousand headed kale? pilfered from a friend’s allotment and are propagating plants from that. Our latest accession is a tree collard from Norway, currently a tiny cutting which has just taken root.